The foam cream protects the skin with a breathable barrier. The patented composition ensures, that the shield of the skin protects against causative organisms and prevents from external factors. Selected ingredients accelerate the healing and reduce the inflammation and the itching. Panthenol improves the skin elasticity, supports the regeneration of skin cells, smoothes itching and has anti-inflammatory qualities. Madecassoside boost the collagen synthesis and activate the cell regeneration of the skin surface. Mikrosilber has antimicrobial effects against multiresistant bacteria and germs. Furthermore it strengenths the natural protection function of the skin. 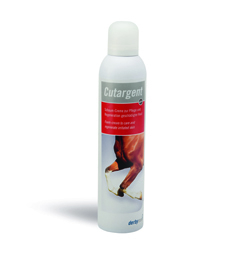 After the pretreatment and cleaning of the affected skin areas with Cutargent preactive, you can apply cutargent foam cream.